Developers of online casino games may differ from each other in a number of different ways. Some have been around for decades, while others will focus more on classic games or modern videoslots. And some others may be unique in the sense that they have an absolutely awesome name! 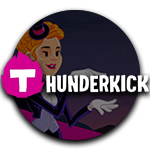 Thunderkick is the name of a brand that you won’t forget quickly, because it is extremely catchy and it will make you think of something cool, like a retro videogame or a first edition comic. But all jokes aside, Thunderkick has a lot more going for it than just a catchy name. They are responsible for some of the most unique online slots around. And that is pretty impressive, especially considering the fact that they have a relatively small team of people working for them! The company called Thunderkick came into existence in 2012. It was just a couple of guys who wanted to make new games that were different and engaging. They actually did pretty well in that aspect, because their brand grew more and more over the year, and they started getting a lot of name recognition. We’ve actually gotten to the point where every experienced gambler on the internet has heard of this developer and that is no easy task! At this point they are still an independent supplier of slot games and a remote gaming server with offices in Stockholm and Malta. That is obviously because they are originally from Sweden, while they also need to stay in touch with the operators that use their games, which are generally located in Malta. Speaking of which, there are hundreds of different websites that offer the collection of Thunderkick slots and there seems to be no sign of them slowing down. These games can be found at more online casinos every day, which is definitely a good thing for gamblers in general. Because their products really are unbelievably fun and original. When you visit their official website, the first and only message that you get to see is simply “We are Thunderkick, and we make games!” That seems pretty cool and confident, but don’t you worry, because they can definitely back that up. You will find out how as soon as you start trying some of their slots in their public ‘free to play’ lobby, or at your favourite online casino of course. Thunderkick has made a couple dozen online slots since 2012. This includes a couple of neon-coloured, psychedelic and retro types of games, but they’re mostly comical. One could say that their most famous slots have a bit of a cartoonish theme going on and that is definitely not in a bad or in a childish way. For example, the Magicious slot features two magicians who are shown on either sides of your game screen and who will make winning combinations with their magic wands. Not in a serious manner though, because everything is designed in the typical Thunderkick fashion, with fun designs and enjoyable animations. And they actually take this fun approach to the next level with some of their other games. Birds on a Wire literally shows cartoonish birds that are sitting on a wire, and every time you make a winning combination, the respective birds are instantly electrocuted, after which they fall to the ground! Esqueleto Explosivo also has an interesting theme which is based on the Mexican day of the dead. There you will get to see stacks of skulls which will sing to you in Spanish, while the music and fireworks will only pick up after you make more winning combinations! I can keep going on and on, but it seems pretty obvious that Thunderkick has some of the most original types of online slots around. In many cases they are downright weird, but I can promise you one thing: The bonus features that are made available are always top notch! As I had already mentioned before, there are hundreds of different operators which offer a portfolio of Thunderkick slots at this point. This brand obviously isn’t as big as Netent or Microgaming, but one could definitely argue that they are bringing a refreshing new type of product to the market. You could even say that some of their games are overshadowing some of the latest releases of the bigger brands in terms of quality and originality, although that is of course ultimately up to the player to decide. Do you like the slots that are made by this developer as much as I do? Then you might want to start playing at one of the reliable online casinos that actually offer their products! Registering an account is generally done in less than a minute and it won’t cost you any money to simply become a registered player.